You don’t survive 60 years without a great reputation, and the TEM of today continues our company’s proud history of outstanding workmanship, honesty, and integrity. TEM is a local, privately owned company that has been serving farmers, the dairy and timber industries, councils, and many more for over 60 years. 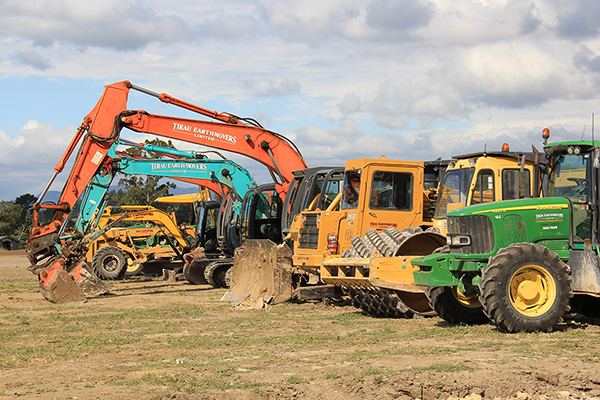 The family owned-and-operated business has grown from its humble beginnings as one man with a single truck to the point where we now run a comprehensive fleet of trucks, excavators, rollers and earthmoving plant. Our company history stretches back to the 1940s, when Alan Hole returned to the Waikato from World War II and as a sole trader with one truck worked for the Public Works Department. In 1957 as the company grew, Alan Hole Limited was formed. Soon Alan’s business had expanded to the point where he was operating three bulldozers. William Ensor bought the company in 1960 when Alan retired. The company continued as Alan Hole Ltd. at 34 Main Road, Tirau, until 1964 when it was renamed Tirau Earthmovers Ltd.
Tirau Earthmovers operated from the Main Road, Tirau, site until 1972, when the office was relocated to 18 High Street. A workshop was used in Pitt Street, Putaruru between 1972 and 1990. In 1985 William’s son Steve joined the business, and in 1990 the company purchased the State Highway 1 site in Putaruru, which finally became a single location from which the business could base its entire operation. Since moving to the State Highway 1 site, we have gradually expanded workshop, storage and other facilities as demand required (and as finances allowed!) Steve bought the company from his retiring Dad in 2003 and has continued as Managing Director since. His own 4 sons are all currently working for the business, and sister Karen has also been working there since 2001 as Finance & Administration Manager. We can confidently say we are definitely a family business!